Global Partnerships (GP) is a non-profit impact-led investor whose mission is to expand opportunity for people living in poverty. In 2005, building from a decade of grant-based programming, GP launched its first investment fund. Since 2005, GP has designed, launched, and managed six debt funds. Through these funds, GP has extended USD 232M of loans to over 100 social enterprises across 14 developing countries. 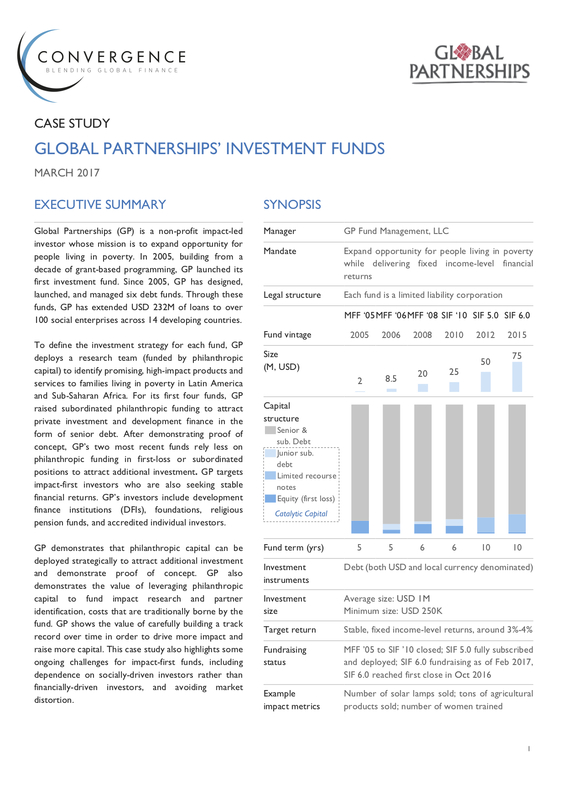 To define the investment strategy for each fund, GP deploys a research team (funded by philanthropic capital) to identify promising, high-impact products and services to families living in poverty in Latin America and Sub-Saharan Africa. For its first four funds, GP raised subordinated philanthropic funding to attract private investment and development finance in the form of senior debt. After demonstrating proof of concept, GP’s two most recent funds rely less on philanthropic funding in first-loss or subordinated positions to attract additional investment. GP targets impact-first investors who are also seeking stable financial returns. GP’s investors include development finance institutions (DFIs), foundations, religious pension funds, and accredited individual investors. GP demonstrates that philanthropic capital can be deployed strategically to attract additional investment and demonstrate proof of concept. GP also demonstrates the value of leveraging philanthropic capital to fund impact research and partner identification, costs that are traditionally borne by the fund. GP shows the value of carefully building a track record over time in order to drive more impact and raise more capital. This case study also highlights some ongoing challenges for impact-first funds, including dependence on socially-driven investors rather than financially-driven investors, and avoiding market distortion.